Has Facebook got a future? Facebook has grown-up, and with that it’s lost the youthful ‘fun’ elements that drew everyone towards it, and it’s now weighed down by all the serious commercial money-grabbing negatives that make being an adult that little bit more miserable. No so long ago Facebook was used by young people as a way of contacting each other to plan what they wanted to do… it was a genuinely creative platform, sharing ideas to improve and enhance each other’s lives. However for adults Facebook has shifted, and it’s now a platform where people tell everyone about they’ve done and what their friends have missed… it’s not creative, it’s historic, and that’s compounded by a small group of more vocal members of the community that drown out the rest. It’s great to share news, but you know what, that shouldn’t be whole conversation and it shouldn’t be one-sided. On top of this there’s an increasing drive to use Facebook as a platform to advertise businesses to friends, which doesn’t sit well with me. Personal – in Facebook terms that’s your timeline and should be your ‘pub’ conversation. Business – for Facebook, that’s a Page (not your Timeline) for advertising. If you think of Facebook as a virtual internet pub conversation, it starts to be easier to differentiate the two. If you’re in your favourite pub on Boxing Day with all your best mates and their kids, the conversation is a heady mix of what you’ve done (some funny incident at work, where you went on holiday), what you’re doing (what work is like or the daft present the kids bought you for Christmas) and what your plans are (will Spring be good for along cycle ride)… it’s a conversation, and will bounce around the room as people contribute, not without an element of Chinese Whispers before it lands back with you. You’re bound to mention work and a sideline that you might working on, but I bet you don’t tout it in that pub conversation – people hear what you’re saying, tuck it away and pass it on to their friends without having it thrown in their faces, it’s what friends do to help each other out… it’s very subtle, but it works. Friends know that I can fix bikes, recommend cycle routes and sort all things internet, in much the same way that other friends take fantastic photographs and design amazing buildings… friends learnt that from those face-to-face conversations, so I don’t need to keep reminding them. Facebook has always been a drain on everyone’s time, but from our perspective it’s now got to a point where there’s so much overhead (with excessive timelines and adverts, not to mention the ‘real’ adverts coming from Facebook and businesses that we’ve Liked at some point in the past), that it’s no longer an effective resource for maintaining any social interaction. Facebook have further compounded this issue of information overload by adding the concept of Groups, so your timeline will now be picking up additions and comments from a much wider group. 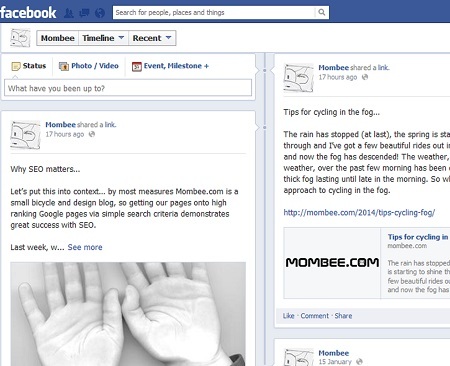 What that means in simple terms to Mombee is that we’re no longer posting to or interacting with our timeline, and will only be using the ‘Personal’ side of Facebook (the timeline side) for Messaging friends. Instead are putting our efforts into using our Facebook Page (not personal timeline!) to promote Mombee as a business to the wider world. With the exception of a couple of like-minded bike/graphic oriented friends, I guarantee that we will never promote this Page on our Facebook timeline – that means that we’re about to embark on an interesting journey to how big a community we can build with Facebook likes from non-FB friends.